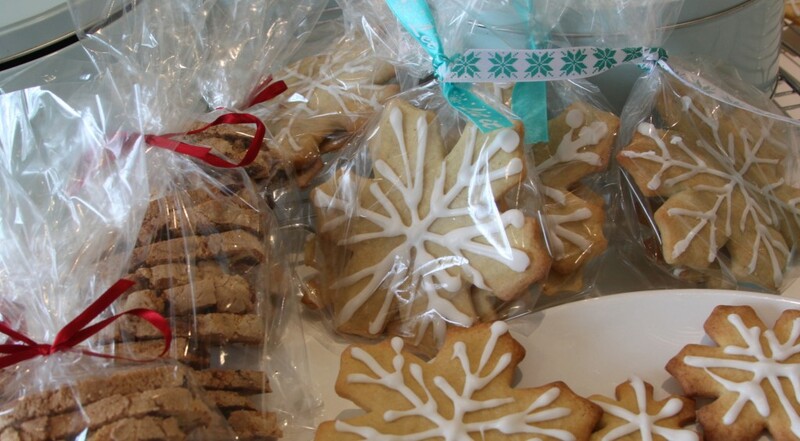 Christmas Biscotti and Snowflake Cookies ready for School Christmas Fair. 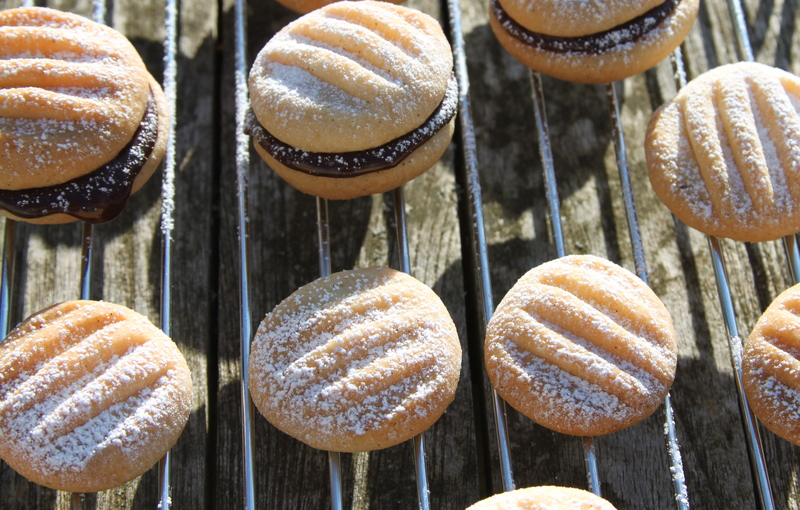 These biscotti are crunchy and fabulous and extremely useful to have in a tin. They go perfectly with a cup of coffee and are just the ticket around Christmas for those of you not so keen on the endless array of mincemeat treats. You can customise the biscotti to your own tastes but I couldn’t resist the red, white and green combination of dried cranberries, white chocolate and pistachios – it is this colourful trio which makes them Christmas Biscotti. By all means leave out any of the above if they are not to your liking, I omitted the nuts when I made these for our school fair. These would make a very elegant accompaniment to coffee after dinner, perhaps with a glass of Vin Santo into which to dip them. Adding a bowl of clementines with their glossy leaves still attached and some big fat dates would make this suitably Christmassy. Preheat oven to 180. Whisk the sugar and egg together, add the vanilla, flour, baking powder and salt and mix well. Finally gently fold in the chocolate, cranberries and pistachios. Form the dough into an oval log and put on a parchment lined tray. Bake for 25 minutes then cool for 5 minutes, cut into slices and put these slices back onto the tray and bake for a further 10 minutes, turning once. Makes about 20. My granny had an orange Tupperware for biscuits which usually contained Nice biscuits (Nice you note, rather than nice). I wasn’t very keen on the container nor on the contents but always forced one down in the way that children seem unable to turn down a biscuit. Now that I think about it, biscuits in the 70’s were not what they are today. Bourbons, pink wafers, custard creams, Rich Tea, digestives, gingersnaps. Then there were Garibaldi, exotically named and invitingly glazed but always mouth puckeringly dry. Viscounts with their pat of mint cream, a real treat as foil wrapped almost counted as confectionery. Oh and those hefty rectangular shortbread bricks which invariably came in a tartan packet. We weren’t exactly spoilt for choice back then. Now however, biscuits practically take up an entire aisle in the supermarket. All the above remain, time will not wither us etc. but there are now hundreds of newcomers from the white chocolate dipped cranberry beauty to the extraordinary pencil thin Mikado. There are Belgian chocolate dipped wafers, American Oreo’s and various French sables and galettes. For the purposes of research you understand I tasted a few old favourites, Breakaway – the chocolate didn’t seem as thick and am I imagining it or are they smaller than they were? Or perhaps I am just bigger. Blue Riband which I remember as a proper after school treat were dry and disappointing. Kit Kat’s happily remain exactly the same. So I parade up and down the shelves looking at what is there and what is new but then a voice in my head pipes up “we will make biscuits at home – home made are much nicer…” When I was a child these words would make my heart sink, bought things seemed so much more exciting and yet, I can hardly believe it is me saying them now. True though and here is a recipe which I hope will prove the point. Preheat the oven to 180 and line a baking sheet with baking parchment. Cream the butter and sugar together and then add the flours and vanilla until combined. Put the mixture in the fridge for 20 minutes to make it a little easier to handle. Take a teaspoonful and roll into a ball, put on the baking sheet and flatten gently with a fork (dip the fork in flour so it doesn’t stick). Repeat with the rest of the dough and then bake for 20 minutes (check after 15) until just golden on top and cooked on the bottom. Cool on a wire rack and dust with icing sugar if you want. Makes about 24. These are perfect as they are but you can see from the photograph that I sandwiched a few with some chocolate icing I had left over. My children loved the doubles with the extra treaty filling – I prefer them unadorned with a cup of tea. I love harissa – for me its fragrant heat seems to go with so many things – and always have a jar on the go. Inspired by Poilane tartines I’ve tried these harissa roast tomatoes with various other ingredients, stirred through nutty brown rice and on toasted sourdough, all good, but this is my favourite. The lentils seem to go with the tomatoes particularly well and the garlicky yogurt is the finishing touch. It is one of those dishes that is not only yummy but you feel is really doing you good. Cheap, super healthy and delicious which is a pretty good combination. Preheat the oven to 180. Put the lentils in a pan with the stock cube, bay leaf, garlic and cover with boiling water, cook for 15-20 minutes (topping up the water if necessary) until cooked but not soft. Drain and keep warm. Pu the tomatoes in a small baking tray, try and balance them so their cut sides are flat and level. Mix the harissa, sugar, vinegar and oil in a bowl with a couple of pinches of salt, pour this over the tomatoes and roast for 30-40 minutes until soft. You can “baste” them a couple of times if you want. 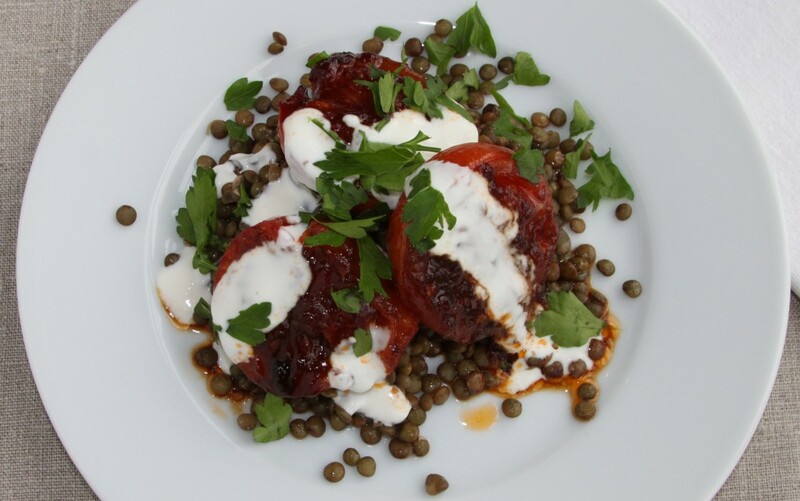 To serve, pile a couple of spoonfuls of lentils onto a plate, top with 3 tomato halves and a good blob of yogurt. Sprinkle generously with parsley. Serves 2. I love to cook. Partly because I absolutely love to eat and so it is a means to an end. More than this though, I actually enjoy cooking, whether an old familiar number or creating something new – will it work, will it be a winner, will it be a disaster? The process and execution, the chopping and stirring, all good stuff in my book. Despite all this Pollyanna like gladness however, I do find one element sometimes exhausting, even a little dispiriting. That is the deciding what to cook – the what shall we eat every day this week dilemma. Shall I feed the children the same safe favourites or risk possible mutiny or delight with new tastes? Is this the week to cook my husband exciting new suppers or will I be exhausted and only wanting to recreate recipes I know by heart. Have I asked friends for supper, if so, what am I going to cook? This is where the perfect Friday night curry comes in. It is properly quick and easy, immensely casual, absolutely delicious, served with a myriad of bought stuff and always manages to create a fun, end of the week celebratory feeling. All you have to do is make the sauce which can even be done the night before. Then it is a case of defrosting the prawns if frozen, warming naan and poppadoms. Decant chutney and pickle into little bowls, make a cucumber, yogurt and mint raita and cook rice. Really not hard. I tend to serve the poppadoms first with chutneys and raita (just like you would in an Indian restaurant really) while the rice is cooking. 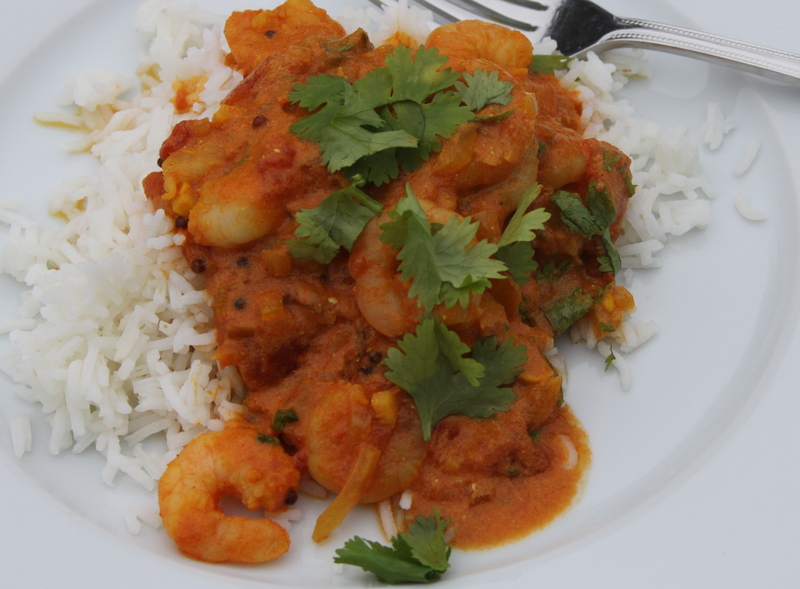 Then, all I have to do is warm up the curry and add the prawns, chop some coriander and serve once the poppadoms have been eaten. I know it looks like a long list of ingredients but you have probably got most of it in the cupboard anyway and it is simplicity itself to make. Small bunch of coriander chopped. Cook the onions gently in the oil for 10 minutes until soft and only just beginning to brown. Add ginger, garlic, cardamom seeds, coriander, cumin, turmeric, mustard seeds and chilli and cook for 5 minutes. Add passata, water and salt and simmer gently for 15 minutes. Add the prawns to either cook if raw or warm through if already cooked, then the yogurt and lime juice. Sprinkle with the coriander and serve with rice. Serves 4. There has been some super chilly weather with both sleet and snow yesterday, winter would seem to be on the way. Today however brings beautiful bright sun and clear blue skies not seen for a week or two. It is days like this when I am torn between cosy warming soup or a rich stew for my internal heating and clinging to the remaining autumnal days with a salad. Not a light summery salad of warm ripe tomatoes and fresh garden herbs, more a chunky robust salad, a meal in itself rather than a little something on the side, as they say. A rummage around in the fridge yields beetroot and rocket. Further search offers up feta and so, we are away. This salad is both earthy and fresh, salty and sweet, soft and crunchy. If beetroot is really not your thing and I blame those deep purple vinegary orbs served at school for putting so many people off this fabulous vegetable, then roasted butternut would be an excellent alternative. Haven’t got any rocket, then dark green peppery watercress would be ideal. Seeds, schmeeds, pumpkin, sunflower, pine kernals – it doesn’t matter, as long as the balance is retained you can customise at will. Preheat oven to 200. Wash and quarter the beetroot (no need to peel), put in a small roasting tin with 1 tablespoon of the olive oil, tumble together and cook for 1 hour. Toast the pumpkin seeds in a hot frying pan until just colouring and put on one side. Put the remaining 2 tablespoons oil in a small bowl, mix with the vinegar, sugar and season with salt and pepper. When the beetroot is cooked remove from the oven and allow to cool a little. 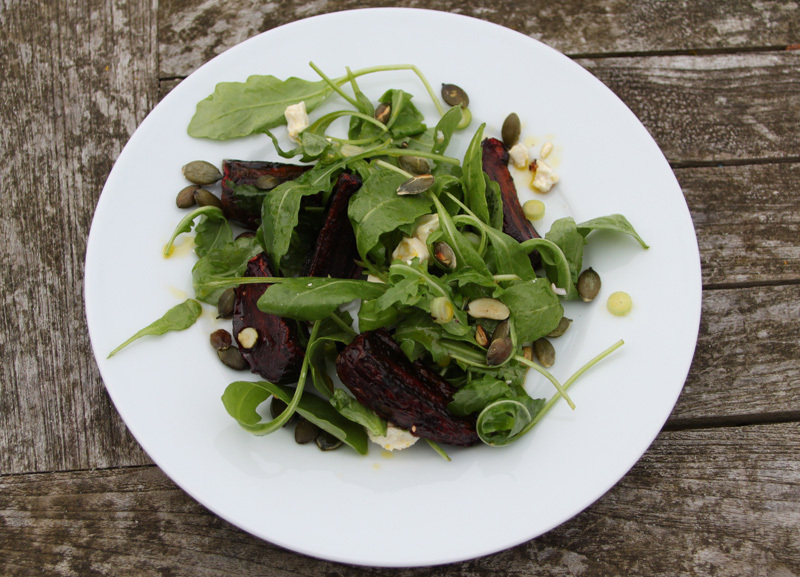 Gently combine the beetroot, feta, rocket, spring onions and the dressing, divide between two plates and sprinkle over the toasted pumpkin seeds. Serves 2. It strikes me this might be rather good with some roast chicken, not piping hot from the oven but allowed to cool until just warm.